Conditions: Soil drying up, but below average temperatures are limiting field activity to manure/fertilizer application and forage/spring cereal seeding. Forages: Alfalfa winter survival is good, generally in the 80% plus range. Winterkill is mostly limited to low/poorly drained pockets. The combination of heavy and moisture saturated soils has led to some heaving. Alfalfa fields not harvested last fall are showing 3” to 4” of new growth, while fields harvested last fall have about 2” of growth. Nitrogen recommendations for grass stands: productive grass stands: 50 lbs of nitrogen per tonne of expected forage dry matter yield per acre (e.g. 2 tonnes of DM = 100 lbs/acre of N); grass stands with 1/3 to 1/2 legumes: 60 lbs of nitrogen per acre; unimproved grass pastures: 50 lbs of nitrogen per acre. 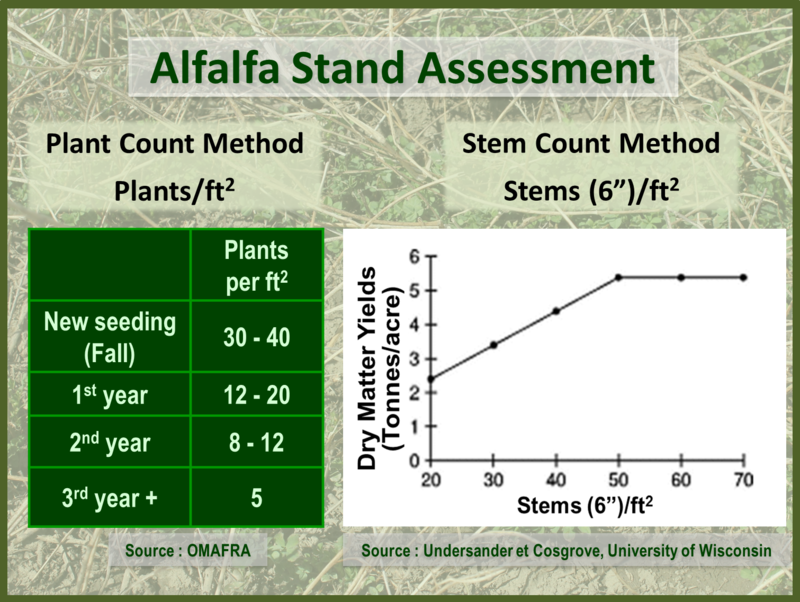 For alfalfa stand assessment (Figure 1.) information visit: http://bit.ly/1P9VO7F. Winter Wheat: Winter survival is generally good with some damage in low spots due to water ponding last winter. A small percentage of the winter wheat stands are struggling and will need to be rotated (worst in West Carleton). In some cases, poor stands is the result of geese feeding last fall. To determine yield potential for various plant counts see Evaluating Winter Wheat Plant Stands. Spring geese management information and permit application forms are available from Environment Canada. A handy field guide (pdf) for cereal growth stages to time application/treatments is available at http://bit.ly/24jEUNl. 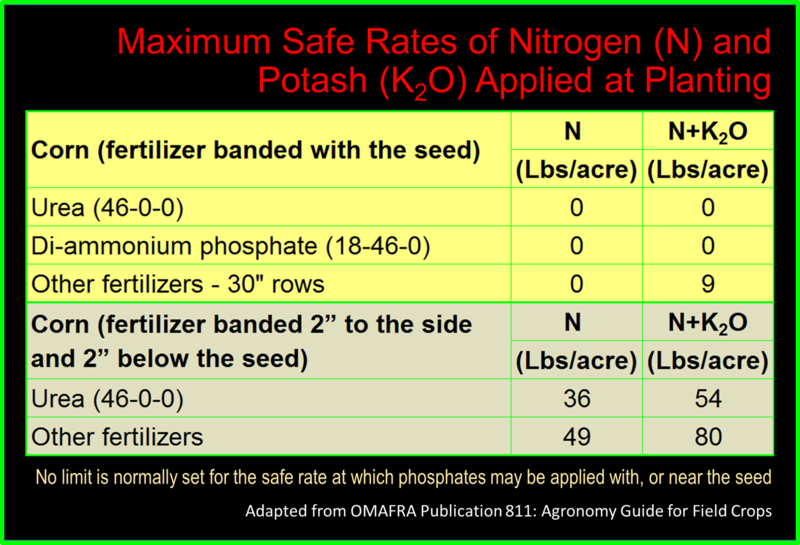 More growers are opting to split their nitrogen application, going with 50 – 70 lbs of N up front. Spring Cereals: Over 50% of the spring cereals have been seeded to date. Earliest seeded wheat is just starting to emerge. Corn: Very little planting progress to date. Suggestion to keep planting depth at 2”, even if planting early. Since last fall, seed dealers spent a significant amount of time handling neonicotinoid regulation paperwork. Seed treatment decisions varies by farm, from fungicide only, to 50% neonicotinoid, to part neonicotinoid/part Fortenza, to 100% Fortenza, to 100% neonicotinoid. A significant amount of old crop corn is still in storage. 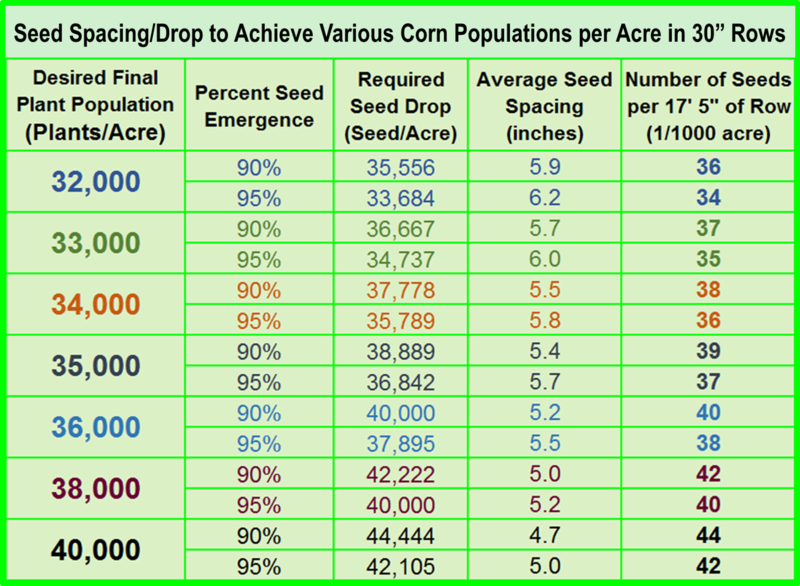 Corn seed drop calculations to achieve various final plant populations in 30 inch rows are listed in Figure 2. Corn maximum safe rates of fertilizer placed with the seed or banded 2” X 2” below the seed are listed in Figure 3, with a more complete listing in the OMAFRA Agronomy Guide. Cover Crops: The pros and cons of planting into a green cover crop was discussed. More information is available on the No-Till Farmer website. Crop Insurance/Agricorp Update: May 1st is the deadline to apply or make changes to Crop Insurance for 2016 crop season. May 10th, 7:30 am, Country Kitchen Restaurant, Highway 31, Winchester, ON. July 28 – Eastern Ontario Crop Diagnostic Day, Winchester Research Farm.